Learn how to make homemade Christmas gift food. Every year I think about making a checkerboard cake. My thoughts were about making one using the traditional Christmas colors of red and green. Each year I have so many other recipes to make for the holidays that a checkerboard cake has had to take “the back seat”. This year I decided to put a checkerboard cake close to the top of my priority list simply to see how it turned out using red and green instead of the normal chocolate and vanilla cakes. Have you ever made a checkerboard cake? Now, there is a pan being sold (I know one is by Wilton’s) to make one of these but actually it is quite simple to make one with the typical cake baking pans. 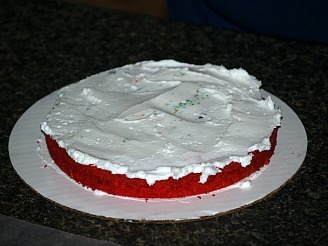 As I learned how to make homemade Christmas gift food, my red, green and white cake turned out beautiful. My neighbors really loved it, even though it was early; a bit before Thanksgiving. It really had a great flavor so it really doesn’t matter if they ate it before Christmas. Learning how to make a homemade Christmas gift food has led me to choosing the following recipe. 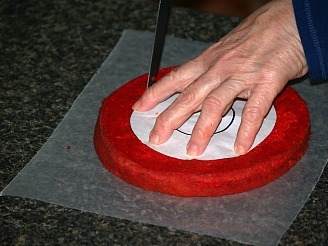 It has a delicious moist texture and is firm enough to hold together while cutting and arranging the circles. I would not recommend a “box cake mix” for this. They are too light and probably would crumble as you arrange the checks. Separate whites from yolks while cold; let whites warm to room temperature. Refrigerate yolks to use in another recipe; I use in homemade noodles. Grease three 8 inch round cake pans; line with wax paper then grease and flour lightly. Cream in a large mixing bowl the butter and 1 cup of the sugar; beat in vanilla and almond until fluffy. On low speed beat in flour alternating with 1 cup of milk. Add 1 ounce of green coloring to one bowl; 1 ounce red to another bowl; add 2 tablespoons milk to the white batter. Stir each of these bowls until thoroughly blended. NOTE: USE CLEAN UTENSILS FOR STIRRING EACH OF THESE BOWLS. 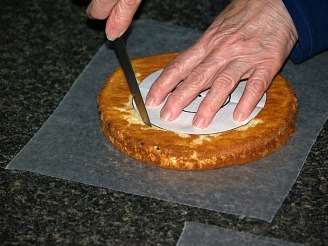 ALSO, AFTER THEY BAKE, MAKE SURE YOU USE CLEAN KNIVES FOR THE CUTTING. YOU WANT TO KEEP EVERYTHING AS NEAT AS POSSIBLE. At high speed beat egg whites until foamy; very gradually add ½ cup of the sugar. Continue beating until stiff peaks form; divide EVENLY among the three different batters. Fold the egg whites into the batters until blended; spoon batters into the three prepared pans. Bake about 20 to 25 minutes or until pick comes out clean; remove from oven and cool 5 minutes. 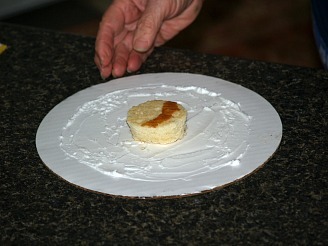 Remove cakes from pans, peel off wax paper and cool completely. 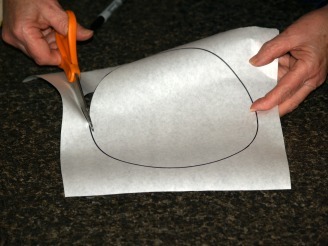 I used freezer paper to make a pattern; place cake pan on paper and draw around it making a circle. 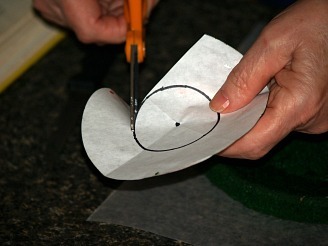 Fold the circle in half and then in half again (I find this useful to find the exact center); make a dot. 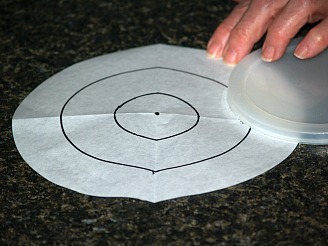 Unfold circle; make a circle in the center using the dot for reference (I used ¼ measuring cup to draw circle). 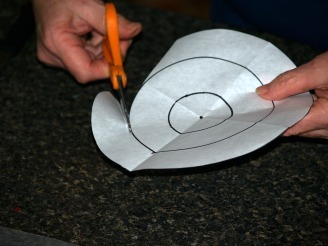 NOTE: All these circles can be made with a compass also. 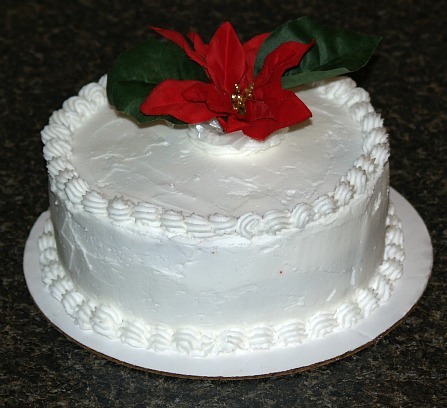 Arranging this cake with the Christmas colors makes a very pretty homemade Christmas gift food. When the cakes are cold cut the outer ring off the pattern and center it on cake 1; with knife cut around the pattern; cut cake 2 around pattern with clean knife; cut cake 3 with clean knife. 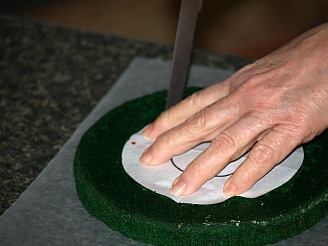 Cut the second ring off the pattern and center it on cake 1; cut with clean knife around patter; center on cake 2 and cut with clean knife; center on cake 3 and cut with clean knife. 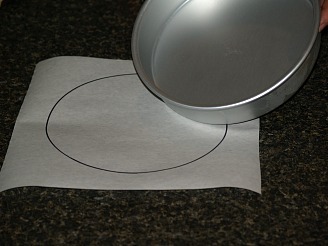 Place the small white circle in the center of a cake plate. 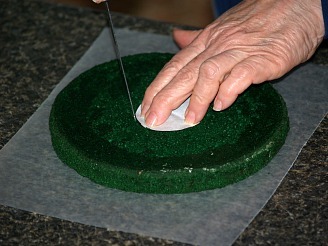 Place the center ring of the green cake around the white circle. Place the large red circle around the green ring. 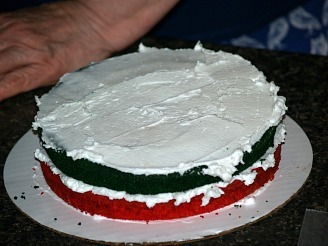 Spread a layer of frosting over the white, green and red layer. Place the small red circle in the center. 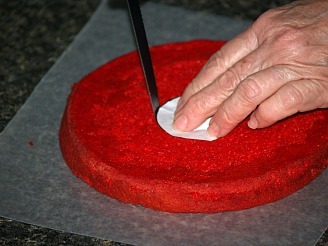 Place the center ring of the white cake around the red circle. Place the large green ring around the white ring. Place the small round green circle in the center. 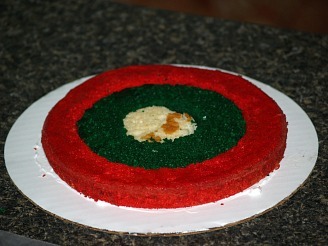 Place the center ring of the red cake around the green. Place the large white ring around the red ring. Frost top and sides of cake; decorate for the occasion. 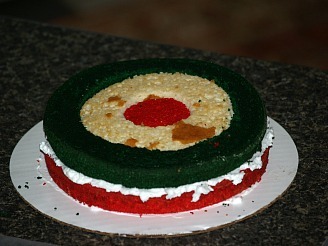 Another homemade Christmas gift food which I like is the spumoni cake. 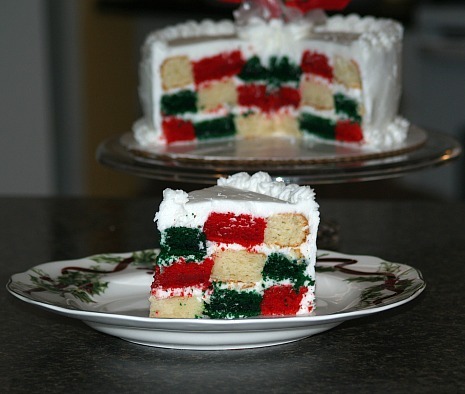 It reminds me of the delicious Italian Christmas cookies; named spumoni cookies. Actually, Italy makes me think about Christmas. 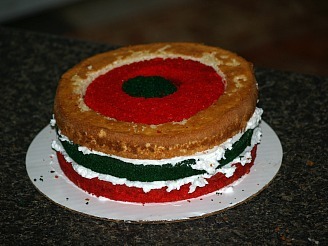 It seems their favorite colors are “red and green”; only spumoni adds a little yellow too. 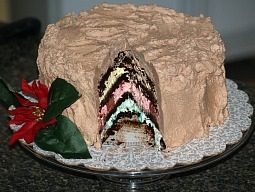 The spumoni cake I make is made with a delicious chocolate cake recipe. 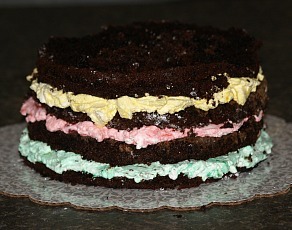 If you have a favorite, use that one but if not try the Old Fashioned Chocolate Layer Cake . The “spumoni part” comes in the finishing touches. 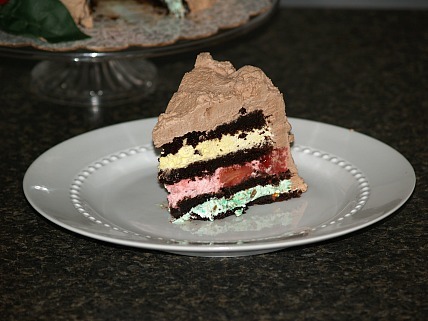 How to Make the Spumoni Cake? Split each layer of the cooled cakes in half so you have 4 thin layers. Whip half of the whipping cream gradually adding half of the sugar until stiff peaks form. 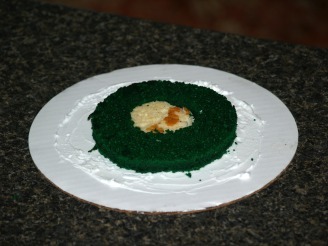 Part one: Add green coloring, vanilla and nuts; spread over layer one of cake and top with cake layer two. 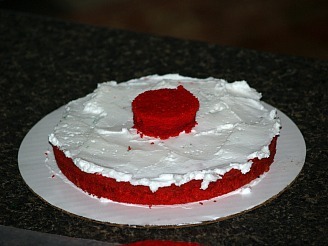 Part two: Add red coloring, and strawberries; spread over cake and top with cake layer three. Part three: Add yellow coloring and rum flavoring with remaining whipped cream; spread over cake. 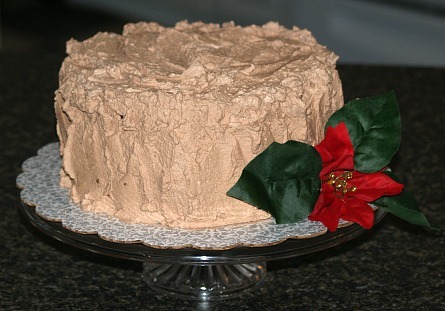 Whip remaining 2 cups of cream with ¼ cup of powdered sugar; add cocoa and cinnamon and frost entire cake and refrigerate. Everyone always loves to receive homemade Christmas gift foods!